JUNEAU — Alaska Gov. Mike Dunleavy is beginning his term without an attorney general, a corrections commissioner or a top cop. 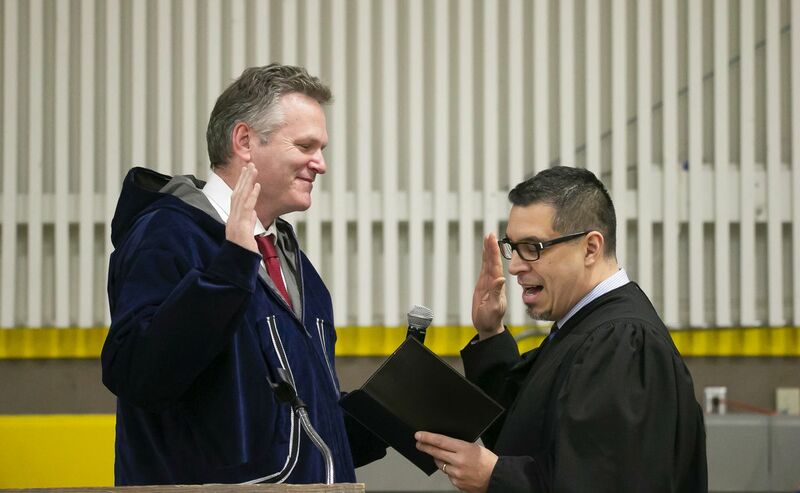 Monday’s inauguration marked the start of Dunleavy’s four-year term in office, and the governor’s top public safety offices are empty as his tenure begins. The administration of Gov. Bill Walker left office at 12:01 p.m., and with it went Walker’s attorney general and the leaders of other state offices. After their departures, the top public safety official in the state of Alaska appears to be a major in the Alaska State Troopers. In the Department of Public Safety, the commissioner, deputy commissioner and the head of the wildlife troopers are out. The head of the Alaska State Troopers, Col. Hans Brinke, retired in October, and his job has been filled on an interim basis by Maj. Andrew Greenstreet. “Obviously, we’re right in the middle of transitions. Things are pretty fluid,” said department spokesman Tim DeSpain. The details aren’t certain: The Dunleavy administration has not released a list of state employees who resigned or were fired during the transition. Officials at the Department of Administration referred questions to the Dunleavy transition team, which said it would release a list by the end of Monday. Later in the day, transition spokesman Jeff Turner said the group would not release a list and that the Daily News should file a public records request with the Department of Administration. By that point in the day, the department’s top officials had been let go by the Dunleavy administration, and the request fell to Kate Sheehan, director of the department’s personnel division. According to the latest available figures, Alaska has 14,546 state employees. A list provided to the Daily News in mid-November by the state showed 804 employees were being considered for layoffs by the new administration. Calls made by the Daily News to various state departments revealed that not all of those 804 people were laid off, but dismissals appear to be widespread and public safety isn’t the only part of state government affected by the transition. The new administration has made a sweep of the top ranks in almost every state agency, and it is not clear whether the layoffs are complete, particularly in departments that do not have a Dunleavy-appointed commissioner. In the Department of Corrections, commissioner Dean Williams is out, as is deputy commissioner Karen Cann. The department’s other deputy commissioner left the department in August, so acting deputy commissioner Jacob Wycoff, formerly the department’s director of institutions, is the top official left, spokeswoman Megan Edge said. Layoffs are typical during the transition from one governor to the next, but their scope appeared to be broader this time around. Some employees didn’t know they had lost their jobs until they arrived in the office Monday morning. At the Department of Administration, commissioner Leslie Ridle knew she was leaving, but Deputy Commissioner Sylvan Robb found out about her firing when she came into the office, and she was still packing her things in the early afternoon. In that department, which handles much of the behind-the-scenes work of state agencies, Chad Holt, director of the Office of Public Advocacy, was fired by the new administration. So was the department’s IT director. Special assistant Minta Montalbo said new Department of Administration commissioner John Quick seems like a capable person, but she resigned before she could be fired. Correction: Jeff Turner’s name was misspelled in the first version of this article.